Four Lady Saints scores season highs as #8 Seward bolted past Allen 79-48 Wednesday night in Iola. Seward played without 34 points and 15 rebounds per game as Joanna Grymek and Clitan de Sousa did not make the five and a half hour trip due to injury. Clitan is out for the season and Grymek may play Saturday vs Neosho. Manuela Fungate grabbed 17 rebounds which is sixth Best in Lady Saint history. She also scored a season high 10. Neody Ocuane (16), Brennyn Seagler (13), and Erin Richardson (10) added season highs. NJCAA player of the Week Mollie Mounsey scored 24 and made three 3’s in the first 1:19. 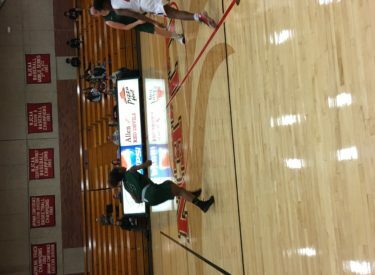 Seward jumped to a 29-11 lead before the Lady Red Devils went on a 21-3 run to tie the game at 32-32 at the half. Seward out scored Allen 47-16 in the second half. The Lady Saints are 10-0 and 8-0 in the Jayhawk while Allen is 3-5. Seward hosts Neosho Saturday at 6 on 107.5 and kscbnews.net. McDonald’s is the buyout sponsor.